It was narrowband time last night in the backyard. I took a couple hours of hydrogen-alpha (Ha) sub-exposures of M17, the Swan Nebula in the constellation Sagittarius. 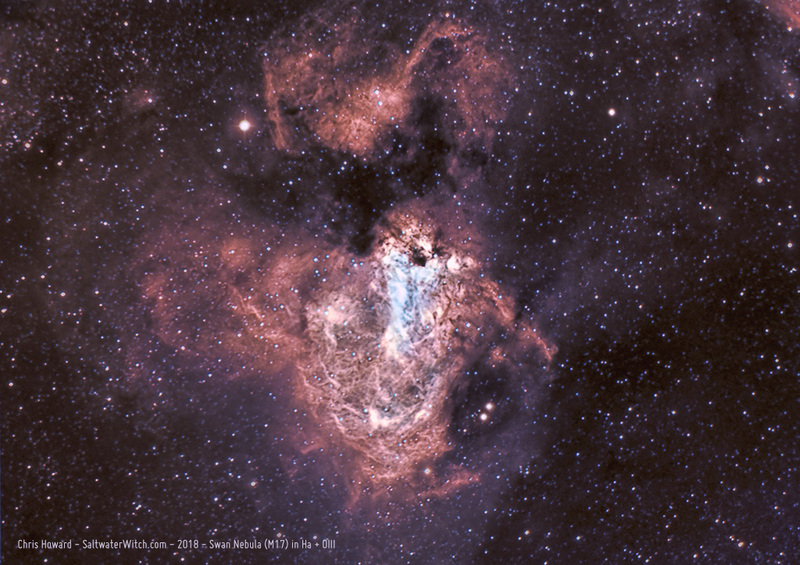 M17 is about 5,500 light-years away. It's also called the Omega Nebula, Checkmark Nebula, and sometimes the Horseshoe Nebula, but all I see is a swan--with a black beak, neck arched forward, and wings outstretched. The bright region in the middle is the swan's chest. I started to take a few OIII frames on the 16th, but by that time M17 was heading back toward the southern horizon, and so I jumped over to the "Cygnus Wall" in NGC 7000 (North America Nebula). I captured several hours of OIII data there, amazing stuff, and I've already posted the finished image in Ha and OIII. I came back to M17 on the 21st, and took another 40 x 300 second subs in OIII. (M17 info: Ha 16 x 300 second + 82 x 120 second exposures + 20 dark frames, OIII 40 x 300 second exposures + 20 dark frames, stacked in DSS, William Optics ZS61, Atik 414EX mono CCD, 7nm Optolong 2" Ha filter, 8.5nm Baader 2" OIII filter, CEM25P EQ Mount, QHY5III178 guide cam with the Orion TOAG, https://www.astrobin.com/352947).